34°40.5’ South by 028°15’ East: The Agulhas Current is as calm today as I’ve ever seen it. A tropical-style squall has formed up away to the west, just to add a bit of variety to a perfect blue-sky day out here in the southwestern reaches of the Indian Ocean. A ceaseless march of deep low-pressure storms have been beating up the Southern Ocean in the mid-forties, but a whopping great high-pressure zone parked this time of year on the Atlantic side of South Africa has been shouldering them south of our position. 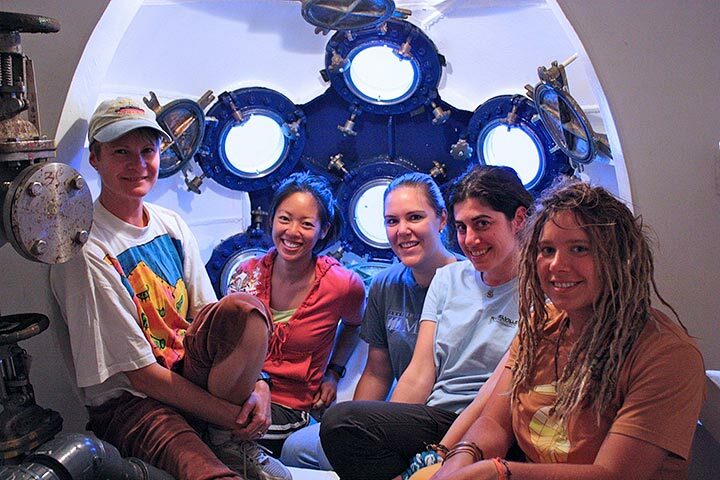 Except for the barely perceptible roll, you wouldn’t know here in the main lab that you were some 100 miles offshore. 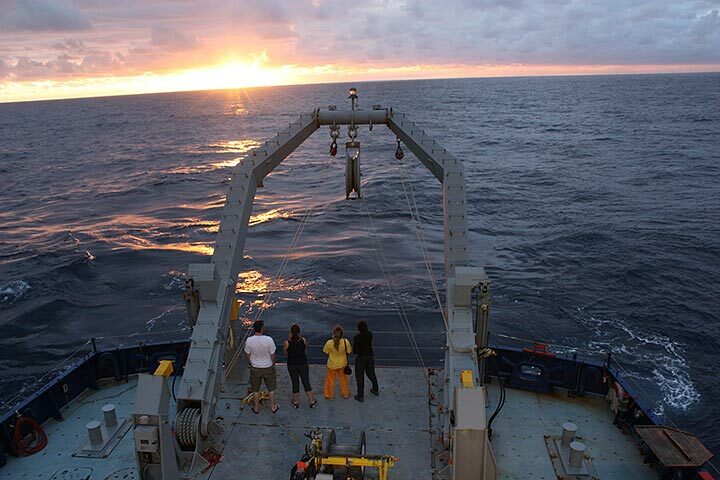 The ship is drifting now as Robert and Greta search acoustically for a bottom lander called an Inverted Echo Sounder. So this is a good time, while we’re able to walk straight down the corridors without help from handholds, to introduce the ship. 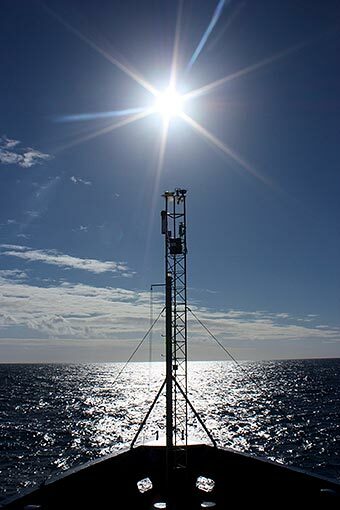 Physical oceanography is a young science because, before all else, it requires a bevy of high-tech, solid state electronics, and acoustic devices with acronymic names. But as that technology advanced rapidly, due in part to a nearly blank check during the Cold War from Office of Naval Research, Melville’s missions expanded in both range and variety. It became clear that a larger ship was necessary. So in 1988 she was sent to the McDermott Shipyard in Louisiana, where she was literally cut in half vertically and 10 meters of deck and houses were inserted, lengthening her to 279’. One of the seams where she was welded back together is still visible on the starboard-side deck. I’ve done several trips in these waters and in the Arctic aboard Melville’s sister ship, Knorr, and taking a stroll from stem to stern over three decks, I was interested to note variations in layout between the two ships, admittedly of interest only to nautical obsessives. However, among the commonalities between them is one that distinguishes research ships from less specialized ships that travel in a straight line between ports—the mode of propulsion. Melvillehas no rudder/propeller structure. Instead, she’s driven by “thrusters,” propellers, two in the stern one in the bow, mounted in housings that can be made to rotate 360° (“azimuthing” is the technical term) to direct thrust in any and all directions. Controlled by the highly sophisticated Dynamic Positioning System (DP), the thrusters allow her to spin in her own length, walk sideways, and most important for ocean research, stop and hold position within one meter of a spot on the bottom. Picture the thrust from all three being directed toward the middle of the hull—she will remain in that position. 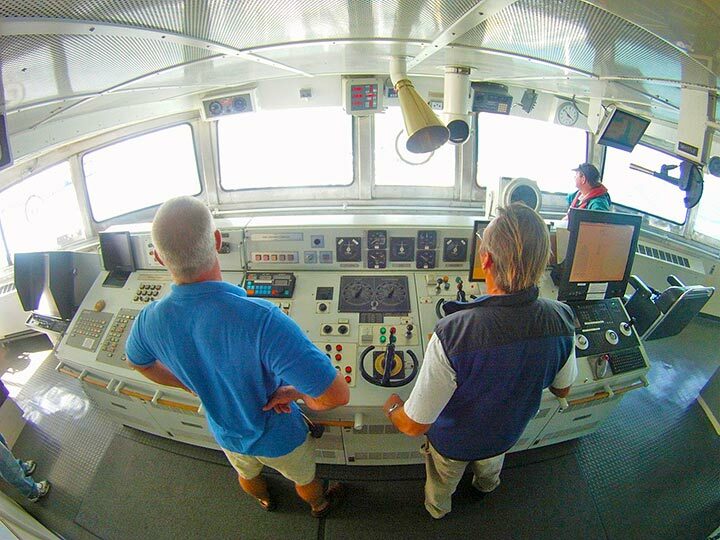 Though the DP controls on the bridge resemble a video game, the system does not remove seamanship from the equation. You’re still floating on moving water and wind, and they always need to be accommodated—even on a perfect day like this one. I hear there are whales away off the stern. I’ll go have a look.